Thank you for visiting the “Kamome’s Italian” website. 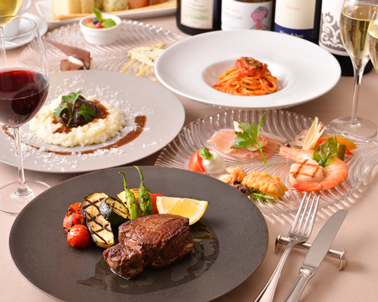 Kamome’s Italian is an Italian restaurant where you can enjoy authentic Italian cuisine together with Italian and French wine. I cherish terroir. Terroir is a word that means soil, climate and culture. When I was younger, I traveled all over Europe. Wherever I went, I found restaurants that had been standing in those neighborhoods for decades without change. Those restaurants welcomed visitors with unchanging flavors that everyone in the neighborhood knew. There was a restaurant like a terroir in one of those neighborhoods. 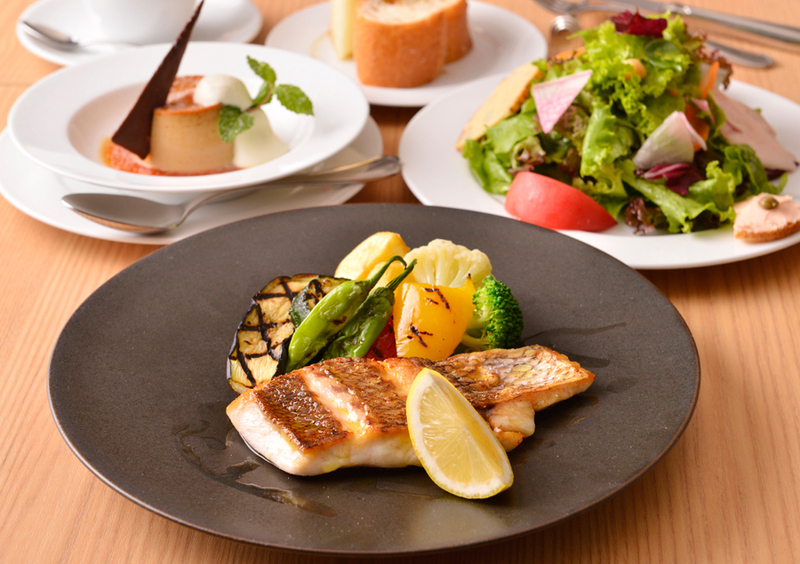 We would like Kamome’s Italian to be like that restaurant. We serve authentic Italian cuisine that takes advantage of ingredients rather than unique and creative food for which the world's top chefs seem to be aiming. Most of the dishes we serve have names that everyone has heard of rather than giving them new ones. However, we aim to make the most delicious dishes you will ever have tasted among those with that name. 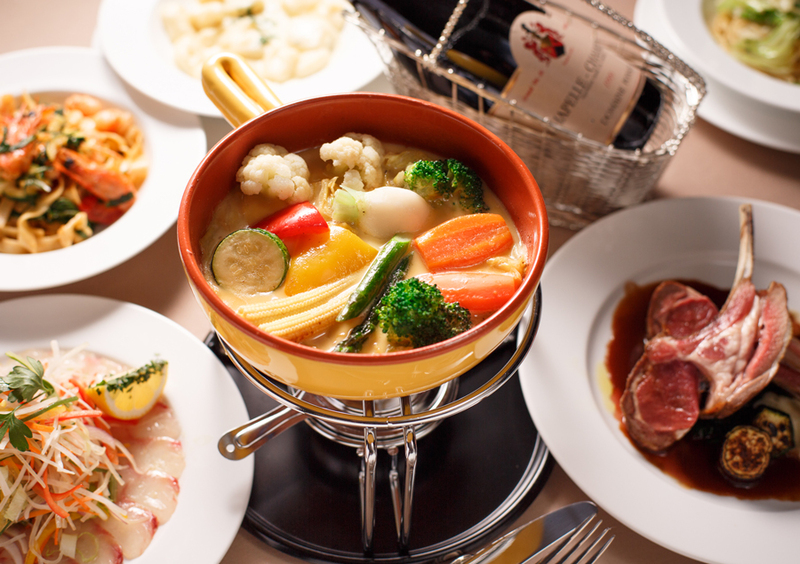 We have divided the seasons in Japan into five and you can choose a delicious meal for that time from among the 200 dishes on our menu. Please enjoy a la carte and course meals. Our sommelier will also recommend you the perfect wine to suit your meal. Please make sure to come and savor the food at Kamome’s Italian. Everyone here is looking forward to welcoming you. 1987～　Graduated from high school and went to the United States. I trained in restaurants in Los Angeles and elsewhere. 1993～　Worked in Trattoria La Baracca and other restaurants. 2005～　Joined Granada and worked in Trattoria Kiora. 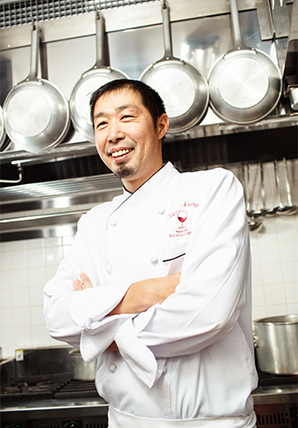 2007～　Joined Piccolo Grande (Azabu, Tokyo) and worked as a sous chef. 2014～　Appointed chef of Kamome’s Italian Restaurant. 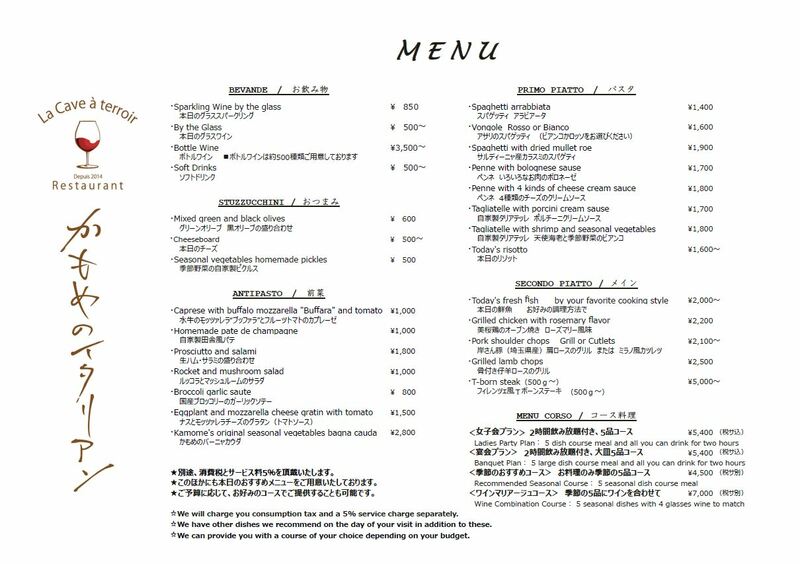 We have staff members who can speak English and Italian, so please feel free to ask about our menu. visit in addition to these. The taste of wine is created by reflecting into it the soil and unique regional climate where its grapes were grown and the feelings and attitude of its maker. All of these factors can be called “terroir.” Nevertheless, La Cave a Terroir "Kamome's Italian" is committed to producing terroir and carefully selecting only wines that allows you to feel terroir. Please enjoy our chef’s cuisine, wine that allows you to feel terroir and the affinity between these. We have a wide range of Italian and French wines available. We have about 600 bottles in 500 varieties on hand. Our lineup has been carefully selected by our sommelier who is committed to finding the best makers. We also have vintages in other years available brought back with care from breweries. Our sommelier will recommend you a wine to your liking to match your meal and feeling on the day, so please ask without hesitation. We also have an abundant range of other drinks available in addition to wines – from non-alcoholic drinks to aperitifs and digestifs. Please enjoy a wonderful drink in conjunction with the cuisine served as another leading part to add color to your important meal. We have about 20 varieties available with a focus on those in the price range around 10,000yen〜. We have about 10 varieties available with a focus on those in the price range around 5,000yen〜. We have a wealth of choices available centered on Italian and French wines with a focus on those in the price range around 5,000yen〜. We have different age vintages available, so please ask for your favorite. We have Italian and Japanese beers available. We also have non-alcoholic beers available. We have various drinks available, including Cinzano, vermouth, Campari and cocktails. We have various drinks available, including homemade limoncello, grappa and liqueurs. We have various drinks available, including juices, ginger ale and mineral water. We are located on the first basement floor in the building with the Kamome Pharmacy on the first floor. We accept reservations by telephone and e-mail. Copyright © La Cave a terroir. All Rights Reserved.